We love to celebrate our Texans' birthdays! Students will be recognized each morning on announcements. Classroom teachers will recognize students in class. If you would like to recognize your child above and beyond morning announcements and the teacher celebration, please see the front office about having your child's name on the front marquee on the day of his or her birthday or half birthday. Thank you for not bringing outside goodies or treats to school for birthday celebrations. 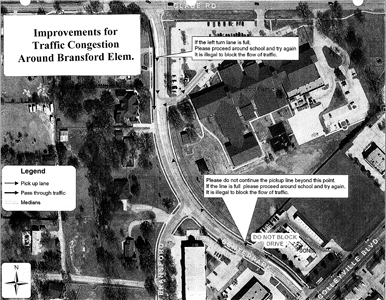 h the following traffic flow issues in the area of Bransford Elementary. The first is north bound traffic (coming from Colleyville Blvd) turning into Bransford Elementary. ALL traffic must turn into the school from the right lane. The roadway is marked for two north bound traffic lanes, turning right from the left lane is a violation of State law and violators will be cited. The second issue is traffic backing up in this same direction all the way to Colleyville Blvd. At the intersection of Colleyville Blvd and Bransford Rd there is a center median with just one north bound lane. Once traffic backs up to this point, although it is rare, it creates total gridlock. Parents are asked to not block the roadway in this area. If you happen to find yourself last in line and notice the vehicle behind you cannot get through, you are asked to drive around the block to avoid blocking the roadway and receiving a citation. asked to not block the roadway in this area. If you happen to find yourself last in line and notice the vehicle behind you cannot get through, please drive around the block to avoid blocking the roadway and receiving a citation. Leave a few minutes EARLIER in the morning. Traffic gets much more congested later in the morning. Student safety is our top priority. Thank you for your patience and understanding during dismissal. Please let the office know by 2:00 p.m. if there is a change in how your student(s) will go home. Students leaving early for the day will need to be signed out by 2:30 p.m. Dismissal begins at 2:45 pm. Meet in the cafeteria and walk out to the back bus lane. The back drive is only for buses and day care vans. Please do not park or drive through the bus lane. Meet in the cafeteria and walk out to the crosswalk and bike rack together. All car riders will sit by grade-level outside the main entrance of BES. Older sibling(s) will sit with the youngest sibling. Cars are to use the entrance on Bransford Road and form two lanes once they enter the parking lot. Cars are not allowed in the pick-up line before 2:35 pm. If you arrive before 2:35 p.m., please park in the parking lot. If you choose to park, please walk to meet your child at their designated dismissal spot. Students will not be walking to the parking lot by themselves. Thank you for modeling safety for our students by using the crosswalk. Cars pull up to the empty blue and red cones in the car lane to allow for loading of multiple cars at once. Display the car tag sign in the front window with student name(s) and grade level(s). Staff will call the names displayed on your car tag(s) to inform students of where to meet their ride. Cars exit on Glade Road. If you are in the right lane, you will exit right. If you are in the left lane, you will exit left. Thank you for not switching lanes in the front drive. Thank you for refraining from utilizing your cell phones in the school zone. If you arrive after 3:05 p.m., you must park and sign your child out from KidzU. For the safety of all students do not drop off your student at school any earlier than 7:15 am. BES staff members are on duty at 7:15 am. Students arriving after 7:15 am but before the 7:30 am bell go directly to the Cafeteria until they are dismissed to their classrooms by BES personnel. If you need to drop off before 7:15 am, Kidzu offers before school care. Parents are asked to send an email each day a student is absent. Please be sure to include the student's name, the date the student is absent, and reason for the absence. When your child has a doctor or dental appointment, please request a note from the doctor's office. Upon your students return please send the note to Shelly in the office.